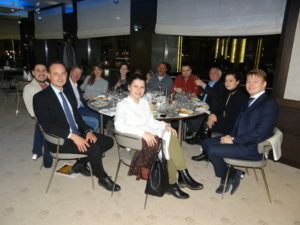 Sofia Skalleague Stanley Stankov had a business trip to Istanbul to attend the EMITT trade show beginning of February. 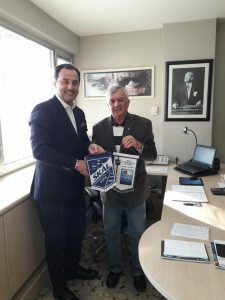 He was wonderfully received by the Turkish Skalleagues of various clubs and especially by President of SI Istanbul, Ata Eremsoy, with whom Stanley exchanged flags. 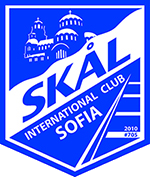 In following communications, a visit of SI Istanbul to SI Sofia in Spring has been mutually agreed. What a way to start 2018 and the first Skal meeting of the year. A huge thank you to the team from the Hotel Central Park who hosted the event. A special thank you to Chef Ivan Gyuviyski, who presented his new menu and feed us all with extremely good food accompanied with wine from Domain Bessa Valley, French Domain Paul Mas and Riesling from Varna region based Sallas Estate which complimented each other perfectly. Thanks goes out to James who presented Rustic Reserve liqueurs and for providing the pre dinner cocktail, Trunki Fizz. The evening truly set the standard for high quality meetings throughout the year with networking, round table discussions and general catch up with friends and colleagues. For those who attended the event thank you for your participation and for those who didn’t, you missed out on a great night. We are already working on the next event meeting in February and will update you all soon. A very interesting round table discussion about employment in the hospitality trade, how it is becoming increasingly difficult and how to try to resolve it by introducing young people into the trade. We were introduced to the new website and would like to thank James and his team at Opportunity Bulgaria for all their hard work. We have some final tweaks before we make the website live and start to ask all members for input. 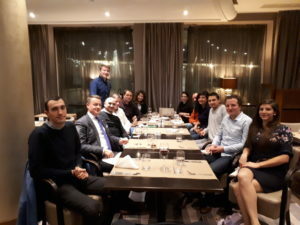 Finally a special thanks to Mr Christoph Glaser (GM Hilton Sofia) and his dedicated team for hosting the event and inviting all attendees to dinner and drinks during the meeting. It is vitally important that all members try to attend these meetings as the more heads around the table the more interesting it gets. In Bulgaria, yoghurt is everywhere. You’ll find it dolloped on falafel wraps, slathered on moussaka and lined up in supermarket refrigerators. It is the basis of traditional Bulgarian dishes such as tarator, a cold soup made of yoghurt, water, cucumber, walnuts and herbs; and snezhanka, a salad consisting of yoghurt, cucumbers, garlic and dill.